Kids Email sent us a one-year subscription to Kids Email Safe Email for Kids, and my son was so happy to review it! My oldest child is in 5th grade, and we don’t allow any of our children to use social media. Up to now, we haven’t allowed email, either. Our kids are AWESOME kids, and we trust them…but it’s too easy for predatory older children or adults to manipulate, trick, or outright compel good kids to make choices that put them in a bad situation. I know some parents are blase about their children’s safety on the internet, but in my work as a lawyer, I’ve seen far too much – and I’m not willing to risk my own kids’ safety and well-being. I’ll do what it takes to protect them. Until recently, that’s meant that even our oldest child did not have his own email address. 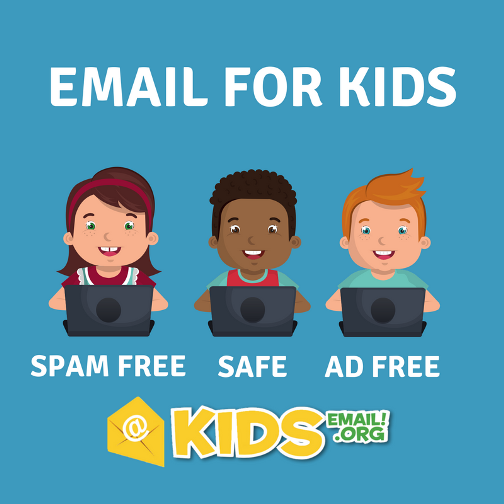 Kids Email has multiple features over and above a regular free email account, and they are enough to give us peace of mind and allow our oldest to have an email account of his own. There is mail monitoring, which worked flawlessly for us. The settings are adjustable so that you can receive copies of the emails you want. I decided to receive copies of emails sent to our son and not to get a copy of emails that he sent. He accepted it well and has not complained since the first couple of days. At this point he can only receive emails from family and a few friends (set up a “contact list” for him), so we’re not worried about him getting anything bad, anyway, but soon enough we’ll open the world to him a bit more and we want to make sure he is learning to protect himself on the internet. He’s got to learn his street smarts, so to speak. I also set up his email so that he could not get links or attachments or photos because I don’t want him getting a virus or malware on the computer. UGH. I do not want to have to deal with that, so for now, he’s limited. The mail queue will intercept email that he gets that doesn’t follow the safety rules we set up – so if, for instance, someone sends him an attachment, or someone emails him who is not on his email contact list, I get the email and can ok it or reject it. I can block emails from emailing him if needed. You can also restrict times that your child can access the email. We don’t need this but some parents would. My son isn’t getting a ton of mail yet, but as he grows he could use this email for school-related things, so the custom mailbox feature is something that will help keep that organized separately from his friend-related emails. There are no ads, so we don’t have to worry about inappropriate ads. His email is really new and he hasn’t used it to sign up for anything at this point, so spam is not a problem, but there is a spam filter that should work well, especially with the other limitations we put on his email. No, it’s not a free email address, but the price is reasonable for 6 email addresses at a price as low as $2.99/month when billed annually. A free, unmonitored email address is not an option for my children. I plan to keep going with this monitored email because my son is really enjoying his own email address, using it daily, practicing writing and typing, and I feel like he’s safe using it.